Mountain View, Jan. 24, 2013– Appcelerator® the leading mobile development platform and Crittercism, the world’s first Mobile Application Performance Management (APM) platform today announced an integration between both of their flagship products and a distribution agreement. 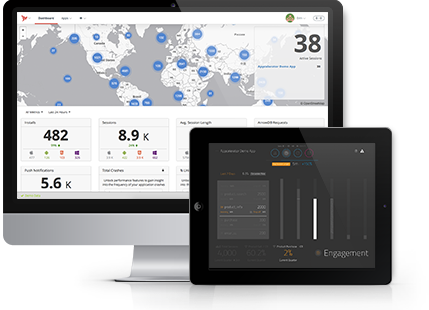 Tightly integrated into Titanium®, Crittercism’s app performance management (APM) solution offers a real-time global view of performance across iOS, Android and HTML5 architectures. This new integration between the products provides developers and app business owners with visibility into the health and availability of their Titanium apps. The integrated service processes detailed crash data and trends, identifies the lines of code that caused the performance issue, and captures the set of steps a user took that led to the problem. Appcelerator’s 1,400 enterprise customers will now have the ability to monitor and manage app performance in real-time through a single, easy-to-use dashboard as part of the mobile app lifecycle. As a result, mobile users will benefit from a richer, more immersive native, cross-platform mobile experience. “Mobile app owners care about innovation, a transformational user experience and strong adoption. By combining Appcelerator’s Titanium 3.0 with Crittercism’s Mobile APM, enterprises can now understand user adoption challenges by quickly identifying and addressing performance problems when and if they occur. More importantly, this combined solution gives mobile app teams the visibility and actionable insights to ensure business success,” said Appcelerator CEO Jeff Haynie . Mobile development and app crashes are the top two issues affecting user retention and in-app purchases. As such, Mobile APM is critical and has a direct impact on app store ratings, reviews and revenues. Crittercism supports Titanium 3.0 today. For more information about the performance management of Titanium applications, please visit http://www.appcelerator.com/platform/performance-management/ or www.crittercism.com. Crittercism, based in San Francisco, California, is the world’s first mobile app performance management (APM) solution that offers a real-time global view of app diagnostics and app crashes across iOS, Android, Windows Phone 8, Hybrid and HTML5 mobile web on over 420 million unique devices and over 30 billion app loads. The company’s investors include Opus Capital, Shasta Ventures and Google Ventures. Learn more @crittercism and www.crittercism.com.